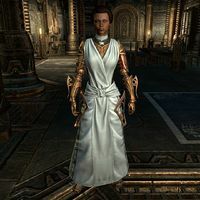 Adjunct Diwa is a Redguard Apostle who can be found inside the Clockwork Basilica. She appears only during the In Search of a Sponsor quest, and cannot be spoken to. After speaking to Provost Varuni Arvel during "In Search of a Sponsor", you can find her talking with Lector Tanel Sadyron and Chancellor Gascone Dusant. Chancellor Gascone Dusant: "As I said before, those tarnished redundants down in the slums are no concern of yours. I've instructed the constabulary to keep a strict eye on them." Lector Tanel Sadyron: "Yes, that Constable Baldan's done an admirable job. Even so, tarnished and exodromals enter the basilica far too often." Adjunct Diwa: "And what of these rumours? Black-robed figures lurking on the edge of the Radius?" Chancellor Gascone Dusant: "Honestly, Diwa, settle the boilers, hmm? I will never let tarnished, or exodromals, or mysterious robed ghosts disrupt our work. Believe me."